T206 Reference....Reflections, etc..... A Tale of Two Unique UZIT cards' "finds"
A Net54er emailed me. Telling me that the Herzog / UZIT card which I claim to be unique is not so. He says that 2 different Pop Reports (SGC and PSA) list this card graded. What he does not realize is that both these Pop Reports reflect the same card. 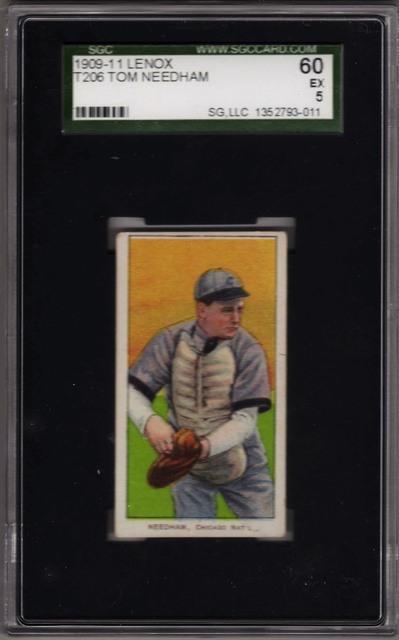 I sold this Herzog card (graded SGC 45) to David Hall (for his T206 Master set) two years ago. David is a PSA guy, so he had this card re-graded. David lost 1/2 a point in the process as PSA graded it a "3". The Net54er appreciated my explanation. Anyhow, this is perfect example of why one cannot always absolutely trust Pop Report data to be an accurate representation of a rare card such as this Herzog. According to the centennnial edition of Inside T206, the only cards known to be vertically miscut AND show 2 different players are from P350-only sheets. 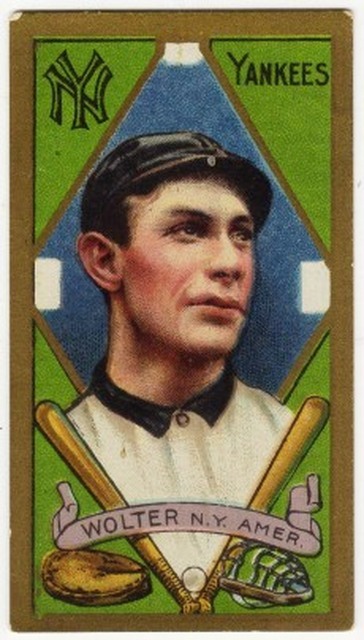 It was a result of the Pirates winning the 1909 WS and being long-printed with some sharing vertical rows with other players. However, I recently acquired an Old Mill back Doc Casey that is vertically miscut, and features a different player at the bottom of the card. 1) Has anyone seen an OM miscut like this? 2) What could be the explanation for the vertical positioning of the different cards like this? Were players alternating vertically in OM? 3) Who might the player with the dark blue background be? Thanks in advance for your input and expertise. Looking forward to hearing theories. Last edited by Silverskulls; 09-08-2018 at 05:37 PM. 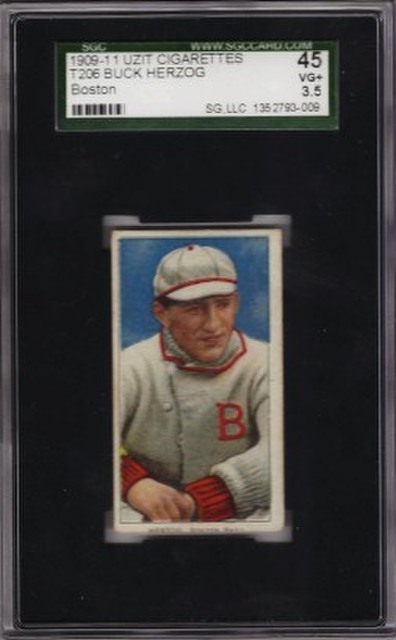 #1....I have seen quite a number of mis-cuts like your Casey (but not Casey....seen other T206's). 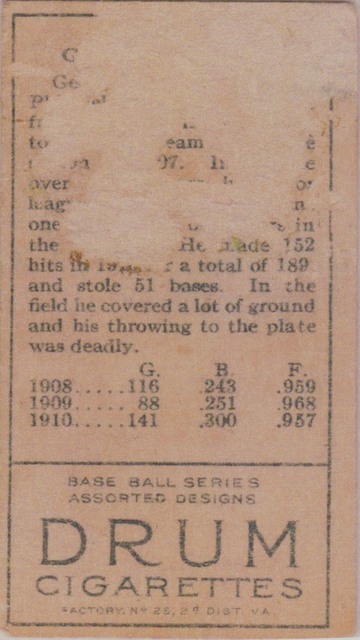 #2....Multiple printings (vertically) of the same T206 subject was commonplace. Followed by a different subject (above and below) that subject. This process was independent of the T206 back. 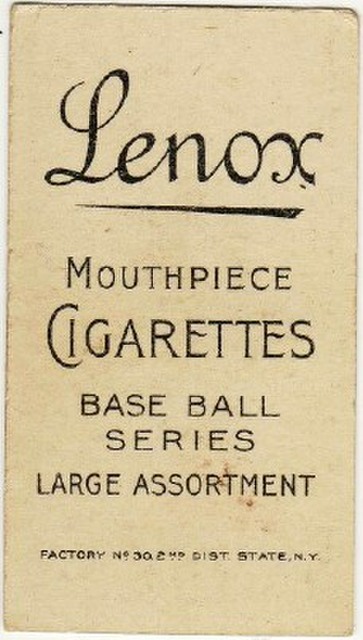 Since the fronts were printed first. #3...." Who might the player with the dark blue background be? " 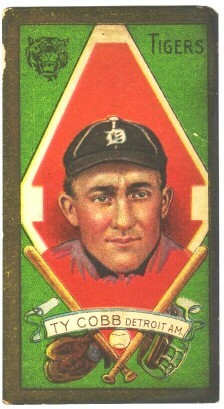 Casey is a 350-only Series subject, and many T206's in this series have dark blue backgrounds. It's anyone's guess which T206 is below Casey. Thank you, Ted! Very helpful. The string is a treasure trove. I think you can cut this down to a handful of serious candidates. no prints you're left with these candidates. these three as strong candidates you're left with these five. might be able to narrow it down further. Very nice card congratulations on picking it up! Last edited by Pat R; 09-09-2018 at 02:20 PM. cool and overcast here so I was bored. I didn't want to distort the colors. My choice would be Knight or Krause slightly favoring Knight. Also, either one of these Hal Chase cards could have been the card below your Casey card. 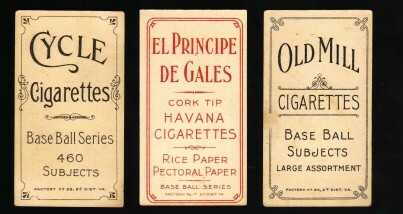 These cards were initially printed on an early 350-only series sheet (circa Spring 1910). there was a Uzit Herzog sold in REA in 2013, so apparently there is more than one. or did you buy the one in REA, ted and then sold it to Hall 2 years ago? Ronnie.....I stated my timeline wrong. .....First, I'll reprise my story which I posted in Post #499 of how I acquired this Herzog card. My old-time friend, Ralph, discovered the Herzog UZIT in a collection he acquired (circa 1990's) in his hometown in the Great Smoky Mountain area of North Carolina. knew he didn't have in his Master set. He recommended that I consign it to the Fall REA Auction. Of course he was the winning bidder. Compare the SGC serial number of the above card on display with the one in REA....THEY ARE THE SAME. 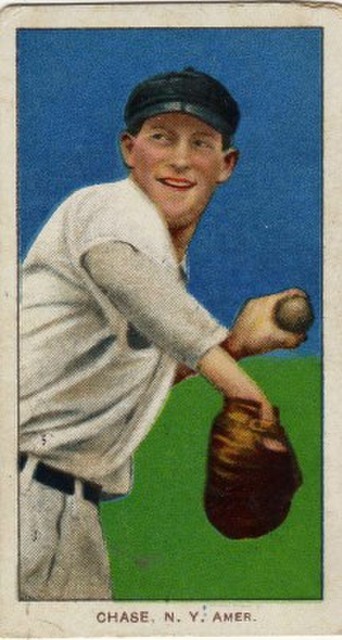 I hope you get it now......as of this date, this Herzog card is still the only known one with a UZIT back. Sorry if I confused you, I got my years mixed up. Time is moving too fast for me. So it was 5 years ago (not 2 years ago) when David Hall acquired this card from me. thanks ted. i get it now. david hall bought the uzit herzog in REA. not from you. Last edited by RedsFan1941; 09-09-2018 at 06:45 PM. I offered the card to David Hall, and gave him a price which I thought was very fair, considering this T206 was one of a kind. us knew from the start of this potential transaction that he would win this card. Thanks guys so much for all of your expertise. I'll continuing digging and see if I can get closer to confirming the blue card showing at the bottom, or figuring out what the card above Casey might be. I'll continue on this topic with my most recent purchase. A little over 5 years ago I acquired 291 tobacco cards. This collection comprised of 274 - T206's and 17 - T205's. Last edited by tedzan; 09-20-2018 at 10:48 PM. Reason: Corrected typo. My title for this post is taken from a very good 1973 Baseball movie featuring Michael Moriarity and Robert De Niro. Check it out if you have not seen it. 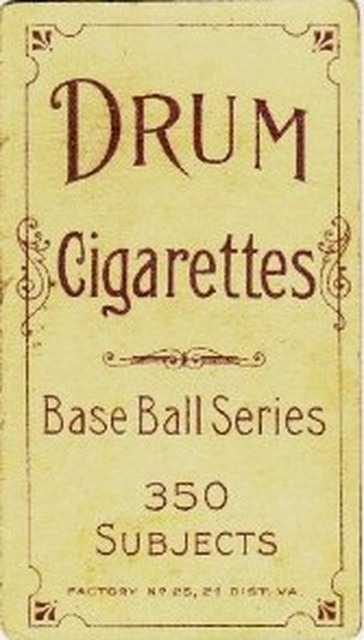 Back in the 1970's and 1980's, DRUM cards (of both T206's and T205's) were considered the scarcest tobacco cards. Of course, this isn't true anymore. The T206 BROAD LEAF 460 and the T205 HINDU (respectively) are tougher cards to find than DRUM. New DRUM cards continue to come out of the wood-work. 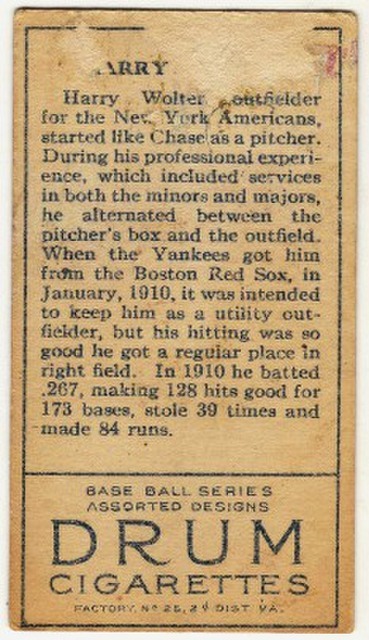 The most significant find in recent years was Ron Oser's which included 51 - DRUM cards. 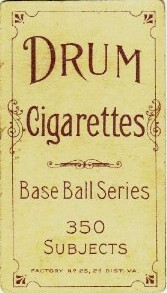 DRUM cards were printed on subjects in the 350-only series and on subjects in the 350/460 series. 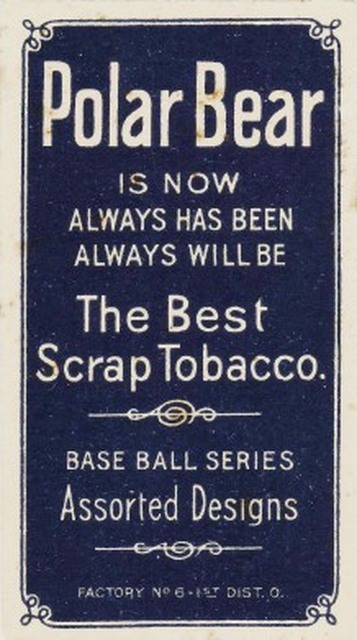 The DRUM cards were issued circa Summer/Fall of 1910. 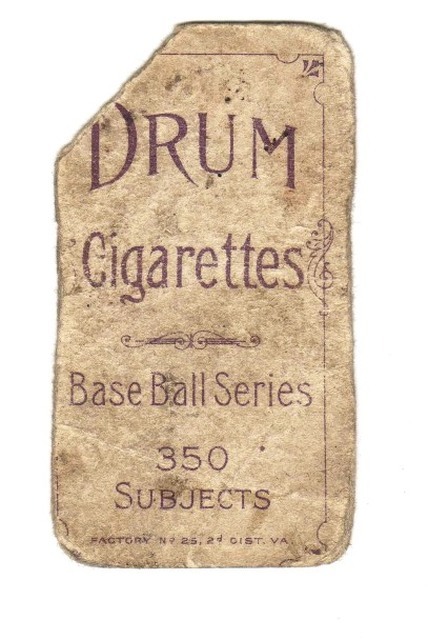 Your turn to show-n-tell us of your T206 DRUM cards. Last edited by tedzan; 10-11-2018 at 08:29 PM. Reason: Updated. Thanks for posting your Street / DRUM. And, did you know that Street is one of the few T206 dudes which has a 350-only card with a DRUM back, and a 350/460 card with a DRUM back ? Thanks for posting your LaPorte / DRUM card. I think there is only one other one known. This DRUM is indeed very rare. found in both of these tobacco sets. Therefore, feel free to also post T205 DRUM cards. 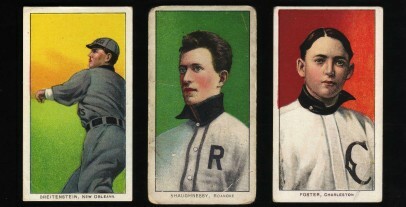 Of the 208 different subjects in the T205 set, only 32 of them were printed with DRUM backs. will eventually be discovered with DRUM backs. Scan courtesy of Mark Macrae. So if you have them, why not post them......T205 DRUM's or T206 DRUM's. Last edited by tedzan; 10-07-2018 at 07:13 PM. Reason: Corrected typo. Hi Ted, I did not know that. I'm glad that I'm not doing a Street portrait back run. 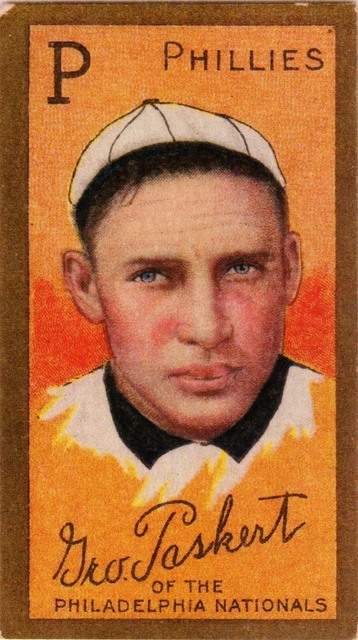 Nice DRUM and UZIT Wiltse cards. Here' my first T206 DRUM....acquired in the early 1980's. It maybe the only DRUM card of Moeller. Here's a T205 Drum from my Yankees collection. T205 DRUM's or T206 DRUM's......if you have them, why not show them. FYI - Portions of “Bang The Drum Slowly” were filmed on location in Clearwater, Florida. Ted, I’m sorry that I do not have anything to bang for your thread. Robert De Niro is his battery mate, and Vincent Gardenia is their team's Manager. Really good performances by all three actors. Di Niro was not a well-known actor prior to this movie....and, Vincent Gardenia was nominated for the Best Supporting actor Award in his role in it. Ted- Epic thread, great work. It's kinda eye-popping how many deals I've done with people here...several trades illustrated in this thread alone- Drums, Bl 460's, Uzits, Lenox's, etc...if I would've kept all the cards I've owned...But alas, I really do enjoy trading. Keeps things fun. And yes, you and I have done some nice T206 deals, dating back to the ole Fort Washington Philly Show days. I will be setting up again at the Philly Show in Oaks, PA in December. Hope to see you there. 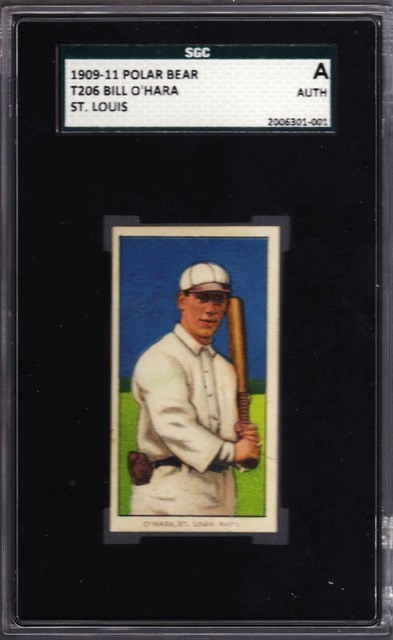 One of the many great cards in my hot little hands at one time but, sadly, no longer is a Drum backed T206 Griffith batting PSA 7, one of the prides of my collection at the time and consigned to Kevin Struss when he was at Mastro. Ted, I guess it had to be a 350/460 series according to your chart. The timeline of the print runs of the 48 subjects in the Southern League (SL) series tells us the story. 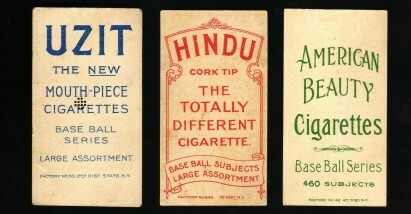 Circa..Summer > Fall 1909, the 1st press run of the SLer's (34 subjects) were printed with HINDU backs. 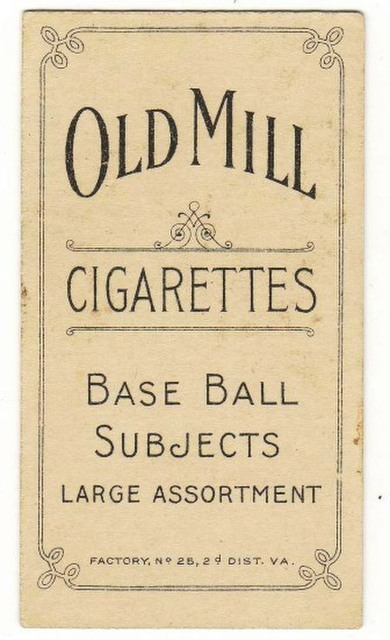 printing of southern league series with Old Mill backs. printing would have had to have started in late spring or early summer. Last edited by Pat R; 10-11-2018 at 01:12 PM. Your guess is yes......Griffith (with bat) is a 350/460 series subject. Listed in Post #516 here are all the T206's which have been confirmed (to date) with the DRUM back. The following lists all the possible T206's which have yet to be found with the DRUM back. If any of you have any of these guys listed above with a DRUM back, PLEASE show-n-tell us about it here. Last edited by tedzan; 10-12-2018 at 09:57 AM. Reason: Corrected typo. I continued my T205 "adventure" by forming these A-B-C-D sub-sets. Here is an example of my favorite...…. I've been searching for the Huggins / DRUM for quite a number of years. Any help here is greatly appreciated. T205 DRUM's or T206 DRUM's......if you have them, why not post them here. 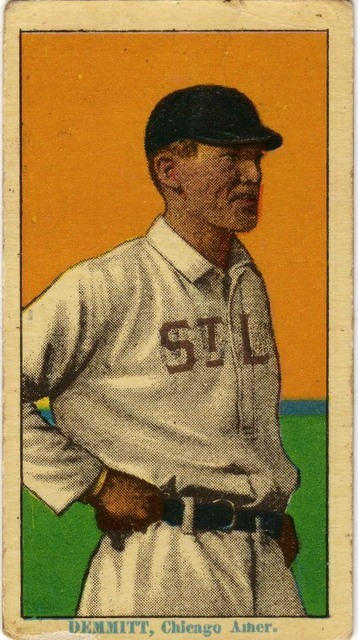 T206 Reference....Guess how many Demmitt & O'Hara St Louis variations exist ? to the Eastern (International) League. Demmitt to Montreal and O'Hara to his hometown team, Toronto. 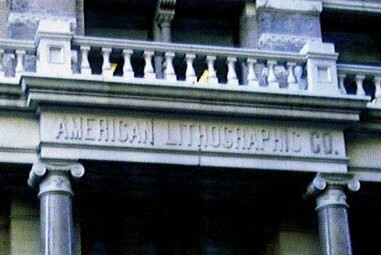 American Lithographic printed 250 different subjects with the POLAR BEAR backs....which include subjects in the 350-only series, the 350/460 series and the 460-only series. variations are currently in circulation. But, before I give you my number, let us hear your guesstimate ? Who knows how many are still out there ? I'll guessimate around 850 each. Guessing there are roughly 350 copies of each of each card. By the way, nice Demmitt! 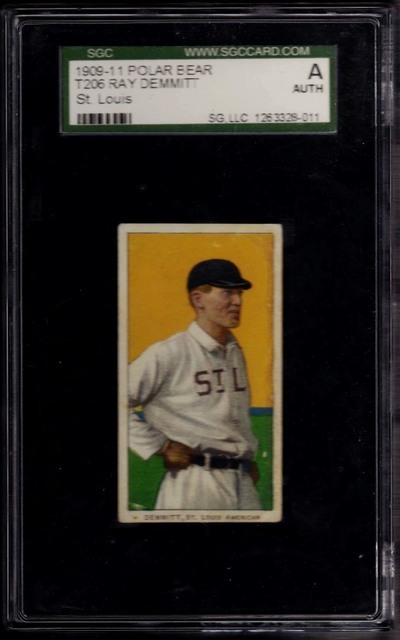 T206 Reference...Reflections...Guess how many Demmitt & O'Hara St Louis cards exist ? Interesting numbers, guys. Continue posting your guesstimates. Thanks guys for all you guesstimates. Let's see if we can a few more inputs ? 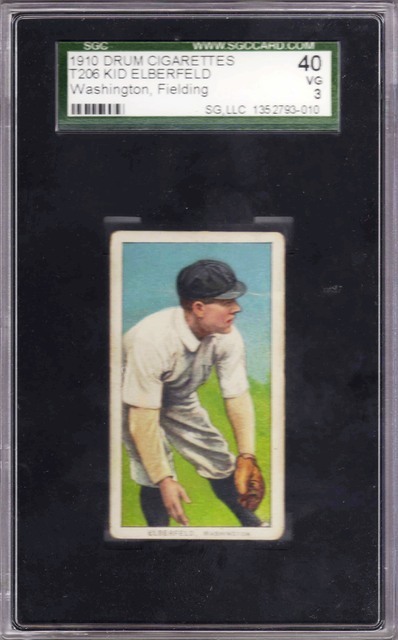 Incidentally, if you are searching for an affordable Demmitt (St Louis) card, you should consider acquiring the T213-2 Demmitt. There is usually one (or 2) for sale on ebay for about $100. Think of the $$$$ you save, allowing you to buy many more T206's. high and skews this average number more than I would guess. Anyway, my number is a little more than just a guess, as have been tracking the St Louis versions of Demmitt and O'Hara for years. Therefore, my "sort of educated" guess is = 350 +/- 50 cards each. So, we are all basically in the same "ballpark"
Thank you for your wealth of knowledge Ted. Many collectors etc. know nothing about the grading services, and about 300 of each of these cards have already been graded. Wonder how many have not been graded ? 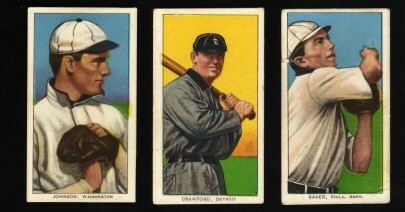 Most cards in general have not been graded. How many of the average polar bear common are out there? Curious how this estimate lines up against the average polar bear population. 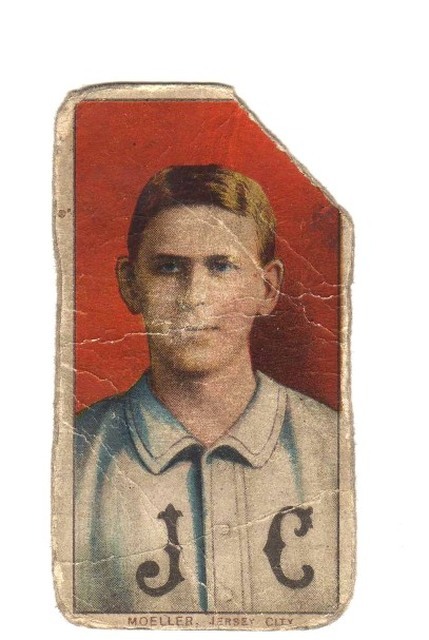 There are 250 different subjects in the T206 set printed with POLAR BEAR (PB) backs. 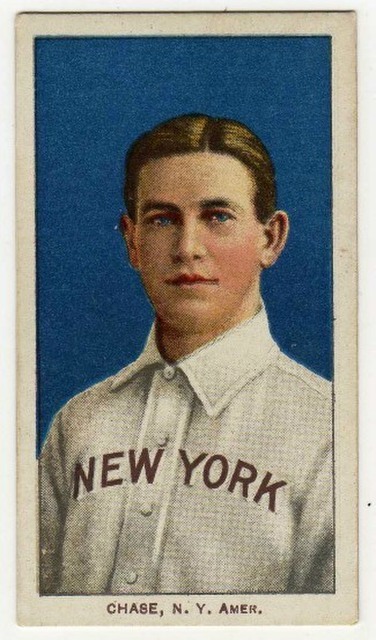 American Litho (ALC) started their 1st press runs of the PB cards in the 350-only series (circa Summer 1910). There are 138 subjects in the 350-only series confirmed with PB backs. The population range of these PB cards is 50 - 100. Subsequently, ALC printed the PB backs on cards in the 350/460 series. In this series, 64 subjects are confirmed with PB backs. The population range of these PB cards is 100 - 300. And finally, the PB backs were printed on all 46 subjects in the 460-only series. The population range of these PB cards is 25 - 75. 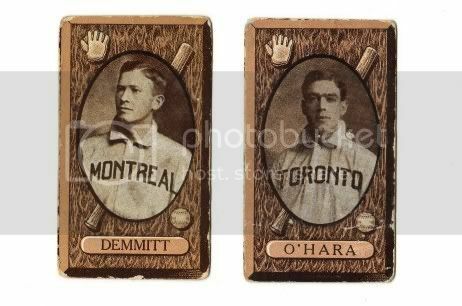 Given the above data, my theory is that the Demmitt and O'Hara (St Louis cards) were printed during the 350/460 press run. Do you think the Demmitt/O'hara are notably any more rare than the average PB common? How would you rate it's survivor population vs the average PB common.